"The hour-strike is an extremely rare speciality, and the configuration used by Ultravox is in fact unique. The mechanism has been revealed, enabling it to be admired in all its complexity. The magic of watchmaking mechanics is embodied by the spinning inertia wheel, the moving yokes, and the hammer that marks out the hours. Two hundred years ago, Louis Moinet's clocks and pocket watches chimed the hours for leading figures of his day. Now, his name has been associated with that of Eric Coudray, an outstanding present-day watchmaker, to create a new masterpiece in the same spirit," explains Jean-Marie Schaller, CEO of Ateliers Louis Moinet. Ultravox is an exclusive creation, designed to celebrate the two hundred and fiftieth anniversary of Louis Moinet's birth. The inventor of the chronograph also designed striking clocks. 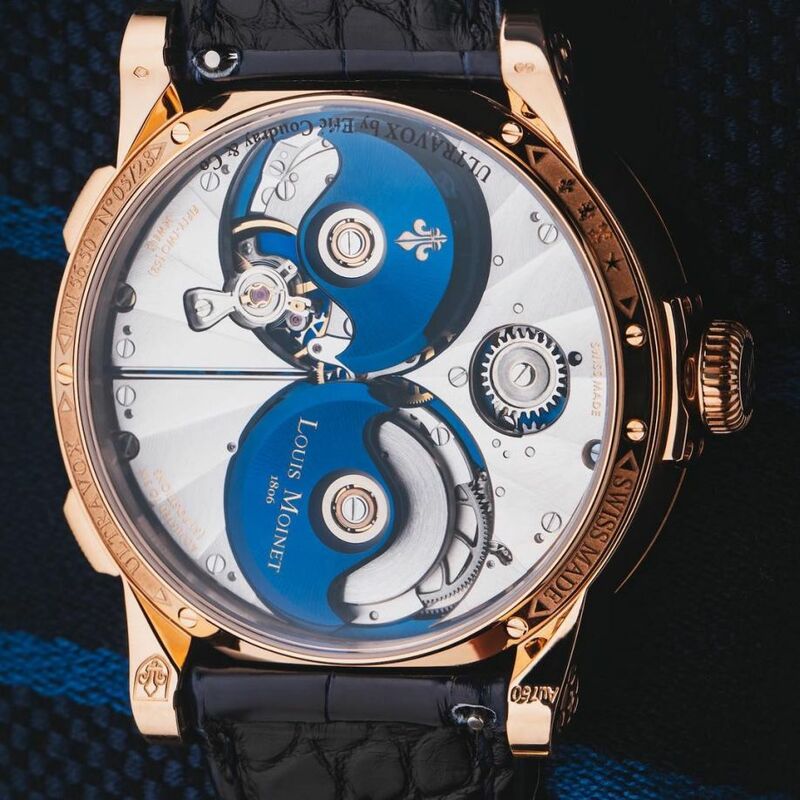 "This tangible heritage has enabled us to design an Hour Strike drawing inspiration from Louis Moinet whilst also being undisputedly rooted in the twenty-first century. 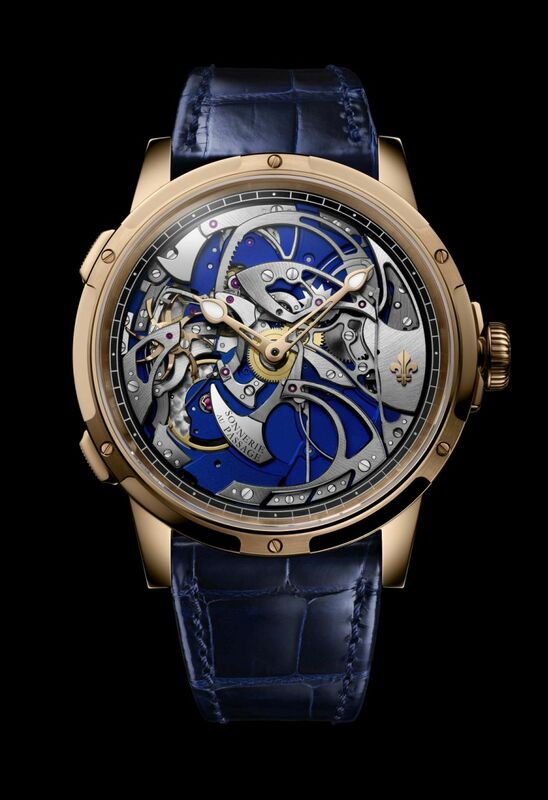 Louis Moinet was both an artist and a scientist. With this in mind, we decided to lay bare all of the mechanics of this complication a world first," adds Jean-Marie Schaller. The case, in 18kt rose gold, measures 46.5mm. It has double sapphire crystals and is water resistant to 50 meters. Movement is the Swiss automatic Louis Moinet in-house caliber LM56 with 52 jewels, 21,600 vph and a power reserve of 38 hours. Functions are: hours, minutes and hour strike. Its "Moinet blue" color illuminates the entire watch, setting off the block-polished and chamfered screws above it. The rear reveals an innovative system of parallel double rotors, also enhanced with Moinet blue. The first of these serves to generate power for the hours and minutes mechanism, while the second is dedicated solely to the chime. A hammer located at eleven o'clock, strikes out the hours on a gong arranged around the movement. The strike mechanism denotes each passing hour on the hour, marking out the appropriate number of chimes. A silencer mechanism also allows the wearer to disengage the chime. It has gold hands with luminous inserts. It comes on a 24mm blue alligator leather strap with an 18kt rose gold folding clasp.